I started (late) blogging through the Alphabet, talking about Homeschooling High School. 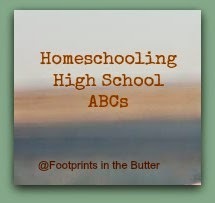 I started with A is for All the Way, mostly trying to say, yes, it is possible to homeschool all the way through high school. Now it's time for B, and I immediately thought about my feelings of inadequacy, and all the reasons to not do this. B is for "But..."
"But I'm not..." smart enough, organized enough, confident enough, whatever-enough. "But I can't teach..." chemistry, algebra, writing, underwater basket-weaving. "But I don't have..." musical instruments, lab equipment, any clue what I'm doing. "But I am just not good enough." That fear was present, for me, anyway, back in the early days too. Especially with a child who just couldn't learn to read, or a kid who couldn't seem to learn the difference between a triangle and a rectangle. Back then, though, I just knew eventually they'd grasp it. Seriously, I didn't understand calculus when I took it. At all. Yet I have a son who is excelling in Calculus. How? Beats me. Well, okay, maybe not. What he has is something I certainly never had. He has a teacher (or two) who knows and loves calculus, who sees its value, and who is enthusiastic and capable of teaching. So that covers the "But I can't teach..." objection. "But I don't have..." isn't terribly hard either. You can get through without huge purchases. There are ways to do science labs without thousands of dollars of equipment. If playing an instrument is important, you'd have to figure that out in public school too. And figuring out just how to do it? There are lots of resources out there, believe me, and you'll figure this out too. Your home high school will be different from mine, and both will be different from the high school at home experts too. The thing is, I'm not in this High School thing alone, and you won't be either. There's a plethora of high school material out there, and you definitely can find something to use to shore up your weaknesses, or to let your child soar in an area that intrigues them but not you. There are legitimate reasons to not homeschool high school. However, the vast majority of the "But I..." excuses that I've heard are easily overcome, if you ask around. My "next week" post will happen in the next couple days. The working title for that one is C is for Credits where I'll talk about all that scary planning types of stuff, like how many credits of science, or how do I know just what is a credit. Marcy is posting a word study, and this week is B is for Bold. There are a few dozen other amazing B posts linked up too. Go check some out! I love the beautiful option of hiring out. We have done that too and it is what makes high school a success in our home as well. Love your posts! Love your series and looking forward to reading about credits! It is overwhelming at times but I know we can do this high school thing!